BLANCHESTER — The second gridiron meeting between Blanchester and Wilmington in nearly a century was a wild affair. 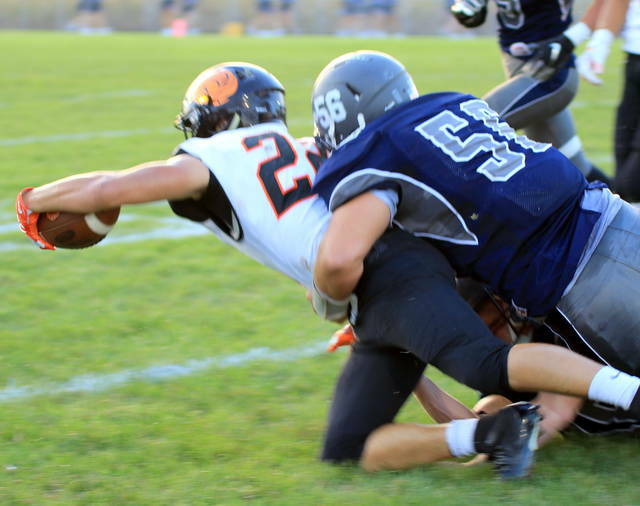 The two teams combined for seven turnovers Friday night. There was a recovered onside kick and a kickoff return for a touchdown. 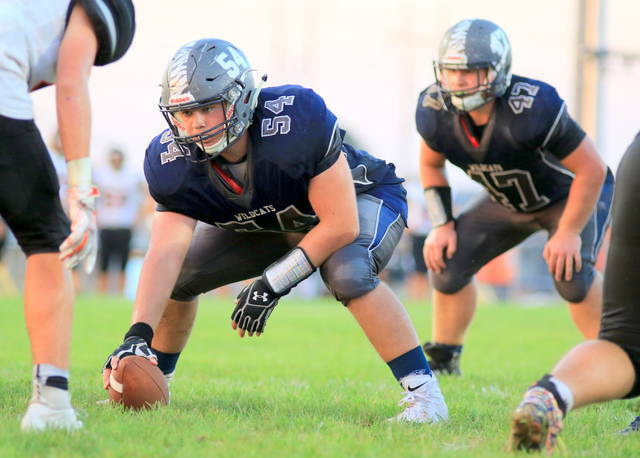 In the end, Wilmington came up with the stops it needed on defense to hold off Blanchester 35-26 at Barbour Memorial Field. One of those hard-nosed kids for Blanchester was James Peters. Running behind a physical offensive line, Peters carried the ball 35 times for 187 yards and two touchdowns. 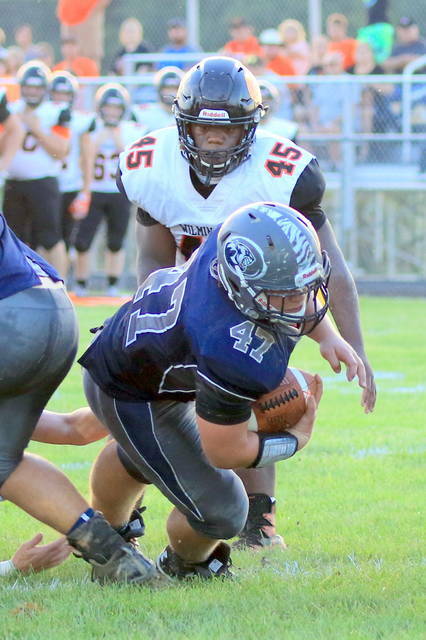 While the teams combined for a wild 33-point fourth quarter, it was a second-quarter stop that may have proved critical for Wilmington (2-2). Wilmington downed a Rory Bell punt inside the BHS 1. 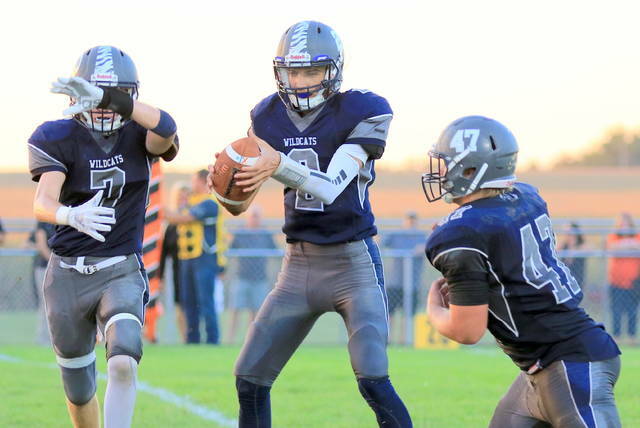 Blanchester, over the next 11 plays, traveled 98 yards to the Wilmington 1. Eight of those plays were Peters’ runs. On fourth and goal from the 1, Blanchester quarterback Brayden Sipple was stopped just short of the Wilmington goal line. The game remained tied at 7 with 10:12 left in the second quarter. Hurricane quarterback Brady Evans began driving his team. He completed five passes in six attempts. He also carried the ball three times. A 21-yard completion to Cam Coomer set up an eight-yard touchdown run by Mason McIntosh. Wilmington led 14-7. The next three drives ended in interceptions. This gave the ball to Wilmington at its own 28 with 79 seconds left in the half. 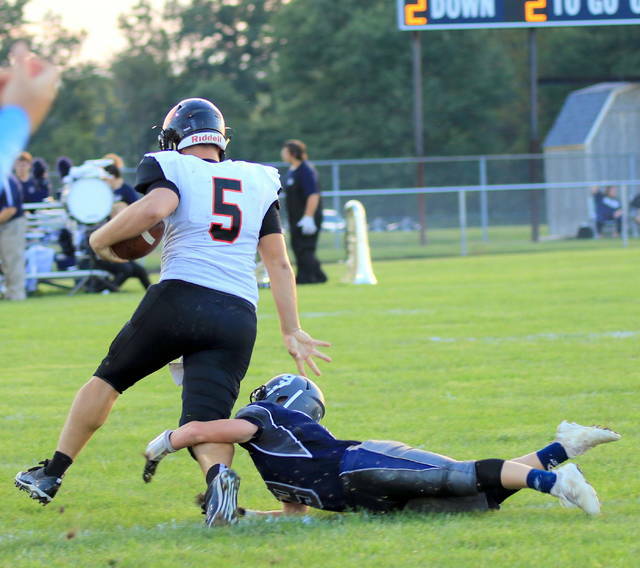 Two completions and a Blanchester penalty put the Hurricane deep in Wildcat territory. After an Evans run, the next snap hit the ground and laid there. 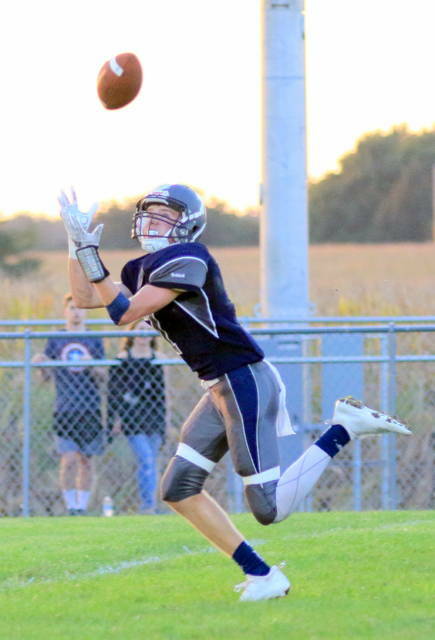 Grant Mayer scooped the ball up and scampered in from 15 yards away to give Wilmington a 21-7 halftime lead. 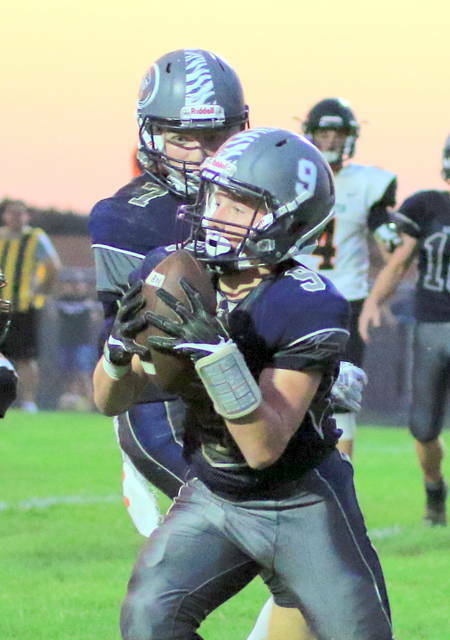 Wilmington appeared to put the game out of reach with 1:19 left after Evans found Coomer for a touchdown to give the Hurricane a 35-20 lead. Two plays later, Sipple found Jacksson Waialae for a 38-yard touchdown pass. The conversion failed, but Blanchester recovered the ensuing onside kick. However, Blanchester went four and out in the final minute to finally end the comeback attempt. “This is probably the first time all year we played as a team,” Sammons said. “First time we’ve seen heart and effort across the board. That’s something to be proud of. Despite three interceptions and a fumble, Evans had a big hand in the victory. 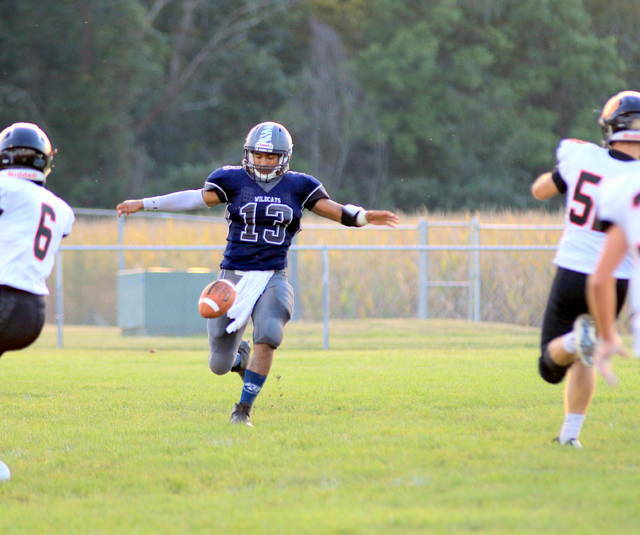 He tossed three touchdown passes and had 279 yards of total offense. PLAYS: W 61; B 65. FIRST DOWNS: W 23; B 18. RUSHES-YARDS: W 36-206; B 41-210. PASSING YARDS: W 243; B 144. COMPLETIONS-ATTEMPTS-INTERCEPTIONS: W 17-25-3; B 7-24-3. TOTAL YARDS: W 449; B 354. PENALTIES-YARDS: W 10-95; B 4-50. FUMBLES-LOST: W 3-1; B 0-0. Rushing (carries-yards): W Brady Evans 13-36; Mason McIntosh 3-52 TD; Isiaih Rigling 4-17; Grant Mayer 16-101 TD. B Brayden Sipple 2-22; Tanner Creager 2-6; Junior Torres 1-2; James Peters 35-187 2 TDs. Passing (completions-attempts-interceptions): W Evans 17-25-3 243 yards 3 TD. Sipple 7-24-3 144 yards TD. Receiving (catches-yards): W Cam Coomer 9-150 2 TDs; McIntosh 2-33; Rigling 4-42; Ryan Camp 2-19 TD. B Creager 3-69; Adam Frump 1-12; Jacksson Waialae 2-44 TD; Clayton Schirmer 1-19.